In the early 1980s Barossa grape growers were introduced to a new grape variety called Merlot. Although Merlot was already a world recognised variety and responsible for the makeup of some of the most premium wines, up until then it had not been planted here in the Barossa. With that, Uncle Ken (Semmler) being somewhat of a pioneer of the day decided to put it to the test by planting a small patch on the St. Jakobi Vineyard in 1980. We’re excited about producing a straight varietal Merlot from the St. Jakobi Vineyard. It’s a variety that is typically used for blending with its big brother Cabernet Sauvignon, but can also produce wonderful wine on its own. Deep in colour, with distinctive perfumed dark berry fruit, hints of tomato leaf aromatics and mouth filling flavours. With good use of oak one can find the resulting wine to be rich and complex. The 2015 vintage brings our fifth release of 80 Block Merlot. It was an early vintage for us at Dutschke with most varieties ripening at once, but like most years in the Barossa was a wonderful year for producing great red wine. The 80 Block Merlot from the St. Jakobi Vineyard is no exception. 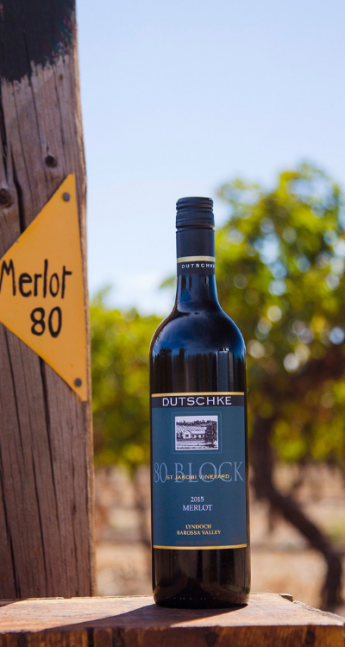 Dutschke crafts a wonderful take on Merlot: fragrant, spicy and packed with red fruits. The great 2015 vintage has given birth to a strong rendition: bright, detailed, finely structured and impeccably tuned for a long life in the cellar.